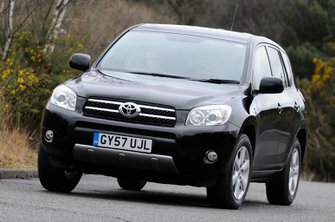 Used Toyota RAV4 Review - 2006-2012 | What Car? What's the used Toyota RAV4 4x4 like? This is the third-generation Toyota RAV4. It retains the compact, relatively sporty character of its two predecessors, but unlike those models, this one wasn’t available with three doors. On the plus side, it’s much more practical than previous versions, with plenty of space for adults in the back, and a large, well-shaped boot. The only problem is that this is accessed through a side-hinged tailgate that makes it impossible to load or unload luggage when another car is parked closely behind. The RAV4 was available with two engines: a 2.0-litre petrol and the more popular 2.2-litre D-4D diesel. This initially came with 134bhp, but after 2009 was upgraded to 147bhp and had lower emissions. A 177bhp version was also offered. Like its predecessors, the third-generation RAV4 is quite fun to drive for an SUV. However, the ride is quite harsh over poorly surfaced roads, and the RAV4 is noisier than rivals such as the Honda CR-V and Nissan X-Trail.